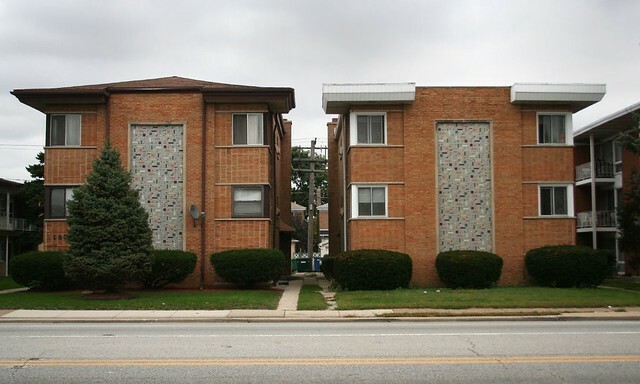 Around the corner from Cermak Plaza, just north on Harlem Avenue, stands a remarkable run of 1960s apartment buildings – almost 50 of them, standing for four blocks in an unbroken row. 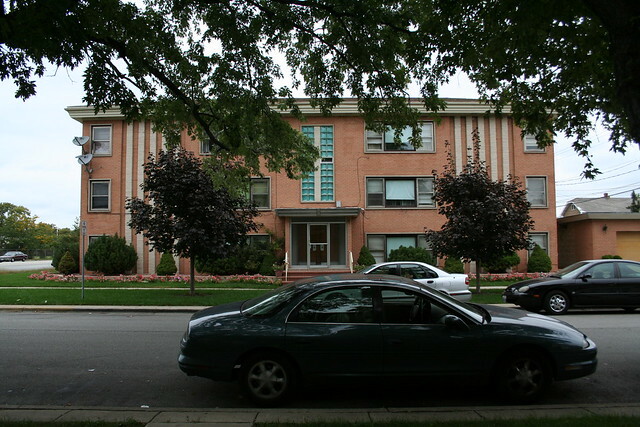 With a range of cladding and ornament applied to a long series of virtually identical buildings, they are an almost perfect catalog of the decorative vocabulary of Chicago’s mid-century builder vernacular. 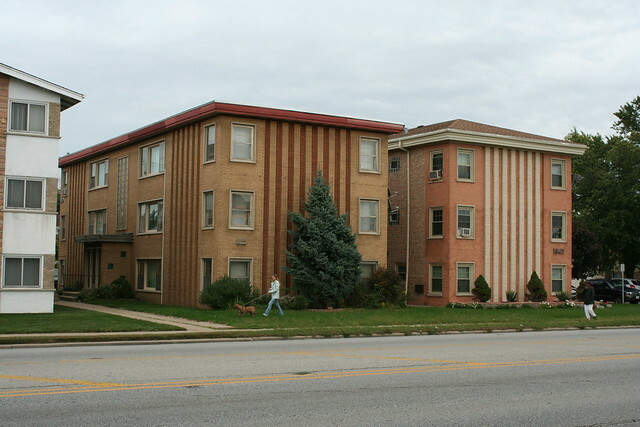 These buildings are primarily the work of one builder: George V. Jerutis & Associates, who put up most of the row between 1958 and 1961. A 1985 Tribune article gives some details of Mr. Jerutis’s life: a Bridgeport native born in 1924, Jerutis was a prolific builder in the Chicago area; by his own estimates, his firm constructed 15,000 buildings of all kinds in the 1950s and 1960s, touting itself as “Chicagoland’s largest multiple builder”. In the early 1970s, he moved out of building and into land development, spreading out into other states around the country. 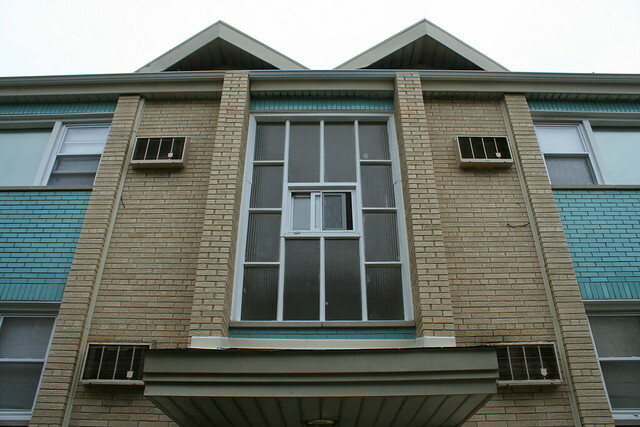 This building is one of three triplets in the row – the same design repeated a few lots apart, at 1909, 1921 and 1931 S. Harlem. 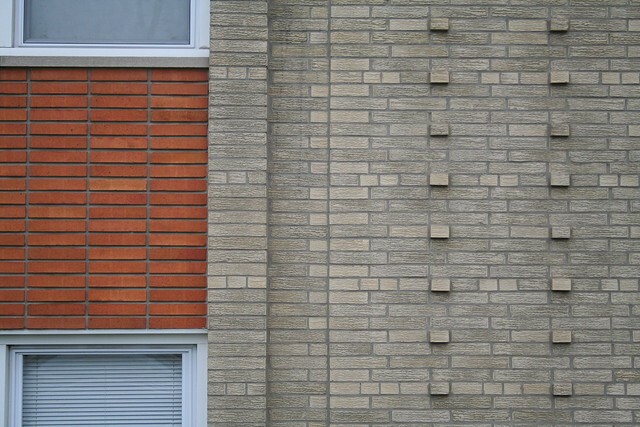 Several others repeat the same design but with brown or orange brick instead of blue. 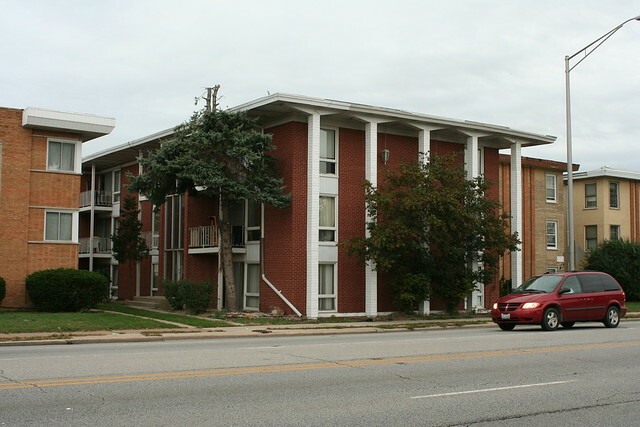 In their advertising, Jerutis & Associates repeatedly emphasized the quality of their work and materials, as well as the high value one could obtain by purchasing one of their buildings. Reading between the lines, it appears that most or all design was done in-house, though if a buyer got in early they could choose the design style, brick, colors, etc. 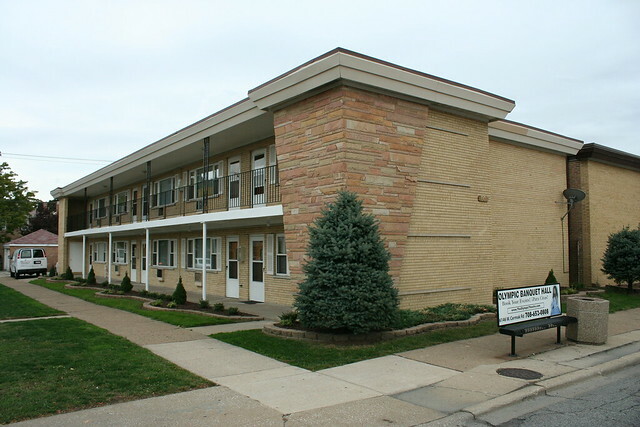 The entryways use a number of devices common to single and multi-family buildings of the era – glass block as a decorative sidelight, geometrically patterned column-screens, built-in planters, and wood doors with delightful patterns. 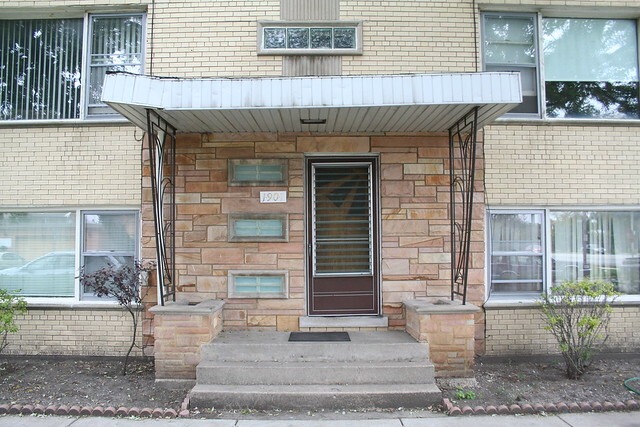 1847 S. Harlem Avenue. 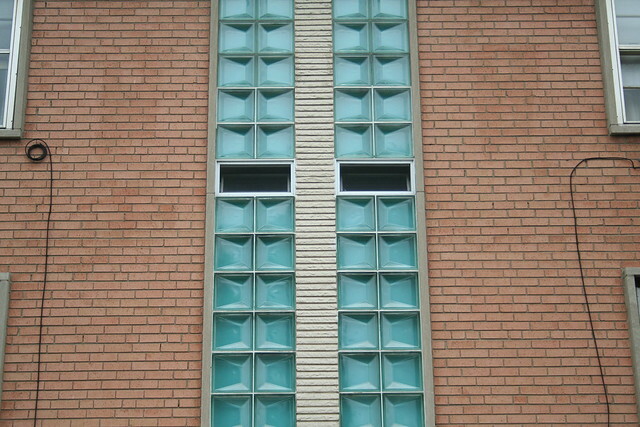 The geometric glass blocks seem to be a more ornate response to this building’s prominent corner location. 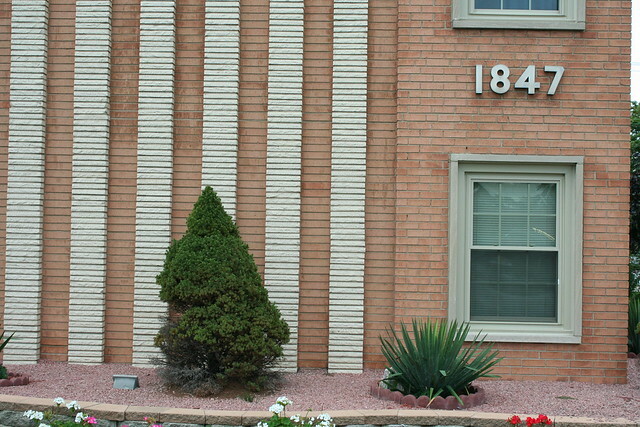 Harlem Apartments – a sort of O’Nassis Modern pastiche at 1817 S. Harlem. 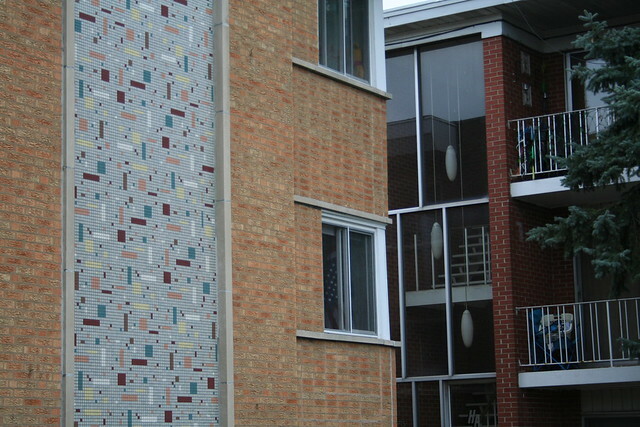 1809 S. Harlem and its twin neighbor feature 1×1 mosaic tile panels in an abstract pattern. These also appear to be by another builder. 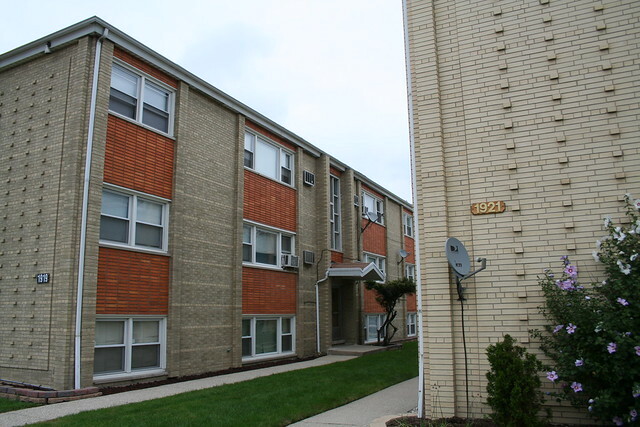 1801 and 1805 Harlem are a break from the usual model; instead of 6-flats, they are two-level breezeway buildings. 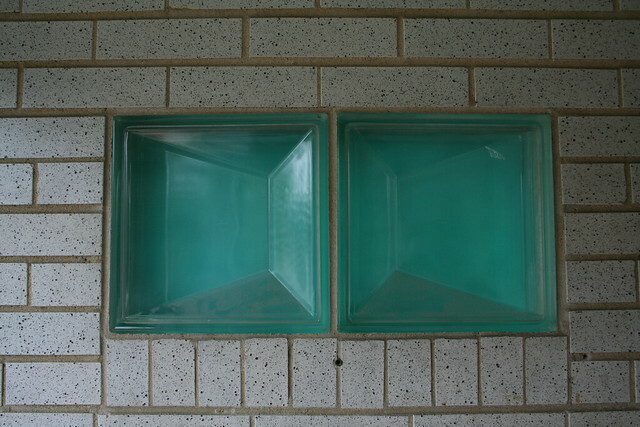 Built in 1960, they are not Jerutis products. 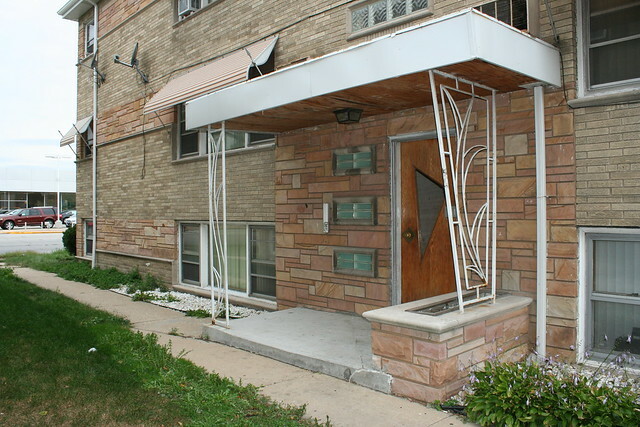 This entry was posted in Cermak Road, Mid-Century Apartments and Flats, Midcentury Modernism. Bookmark the permalink. I just wanted to let you know that I subscribe to your blog and love it. You have the perfect mix of photos and to-the-point information fueled by awe. It’s refreshing to see someone appreciating the city and it’s quirks in a way that is accessible. Thank you for your work!